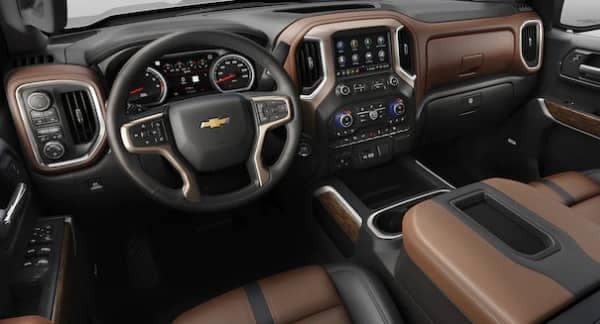 Delivering space, comfort, and convenience, the all-new 2019 Chevy Silverado 1500 interior is a hit with everyone from family drivers to commercial users. The new interior has been redesigned to make controls feel more intuitive and upgrade your onboard technology. A standard 7-inch or available 8-inch touchscreen encourages you to customize your driving environment, and available steering wheel controls can answer hands-free phone calls and manage the Chevrolet Infotainment System display. Drivers know the Chevy Silverado 1500 for its indomitable spirit and workhorse power, so they’re often surprised by the level of interior comfort and refinement. Whether keeping you cool during the scorching days or summer, warm during the darkest nights of winter, or returning to present support settings at the touch of a button, the Silverado 1500 is always working to keep you feeling good. Regular: Offers two doors and seating for three. Extended: Offers four doors and seating for six. Crew: Offers four doors (including full-size rear doors) and seating for six with increased legroom. Thanks to changes made to the body, the Silverado 1500 now offers one of the largest interiors in the segment. Whether you’re looking for plenty of rear legroom for trips between Aurora and Bolingbrook or the cargo space for all your items, the Chevy won’t disappoint. The 2019 Chevy Silverado is a legendary half-ton truck with an award-winning engine and impressive towing specs, and you’ll find yours waiting at Chevrolet of Naperville. To find out more or arrange a test drive, don’t hesitate to contact us today.